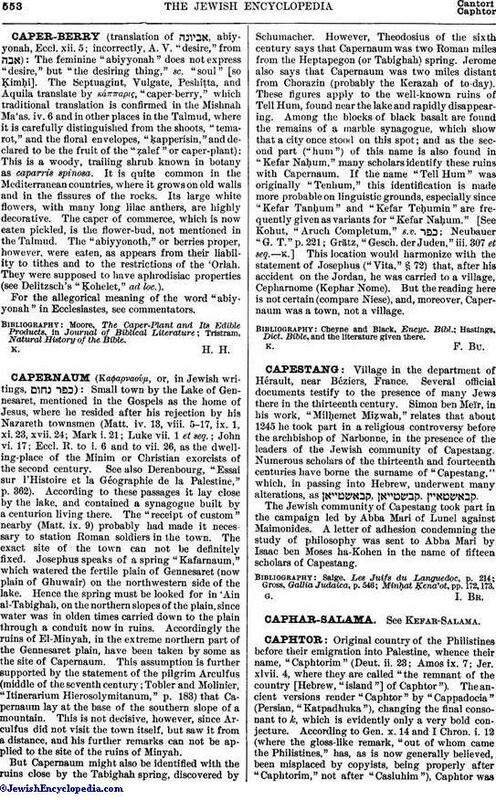 Original country of the Philistines before their emigration into Palestine, whence their name, "Caphtorim" (Deut. ii. 23; Amos ix. 7; Jer. xlvii. 4, where they are called "the remnant of the country [Hebrew, "island"] of Caphtor"). The ancient versions render "Caphtor" by "Cappadocia" (Persian, "Katpadhuka"), changing the final consonant to k, which is evidently only a very bold conjecture. According to Gen. x. 14 and I Chron. i. 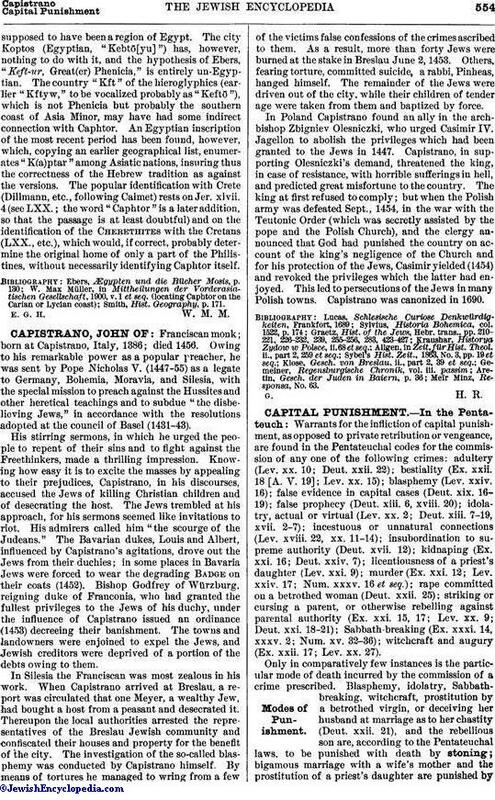 12 (where the gloss-like remark, "out of whom came the Philistines," has, as is now generally believed, been misplaced by copyists, being properly after "Caphtorim," not after "Casluhim"), Caphtor wassupposed to have been a region of Egypt. The city Koptos (Egyptian, "Kebtο[yu]") has, however, nothing to do with it, and the hypothesis of Ebers, "Keft-ur, Great(er) Phenicia," is entirely un-Egyptian. The country "Kft" of the hieroglyphics (earlier "Kftyw," to be vocalized probably as "Keftο"), which is not Phenicia but probably the southern coast of Asia Minor, may have had some indirect connection with Caphtor. An Egyptian inscription of the most recent period has been found, however, which, copying an earlier geographical list, enumerates "K(a)ptar" among Asiatic nations, insuring thus the correctness of the Hebrew tradition as against the versions. The popular identification with Crete (Dillmann, etc., following Calmet) rests on Jer. xlvii. 4 (see LXX. ; the word "Caphtor" is a later addition, so that the passage is at least doubtful) and on the identification of the Cherethites with the Cretans (LXX., etc. ), which would, if correct, probably determine the original home of only a part of the Philistines, without necessarily identifying Caphtor itself. Smith, Hist. Geography, p. 171. E. G. H.W. M. M.